Elizabeth Safrit was crowned Miss United States 2014 in Washington, DC on July 6, 2014. She represented her home state of North Carolina. She made instant history by being the first Miss United States to represent her country in the upcoming 2014 Miss World pageant to be held in London, England on December 14, 2014. Critical Beauty would like to thank Elizabeth for granting us this interview and wishes her the best of luck at Miss World! How does it feel being the first Miss United States to represent your country in the 2014 Miss World pageant? It feels surreal. I say this because only last year, I was watching the Miss World pageant and I remember wishing I could compete there. The Miss World representative for the United States is traditionally chosen from the modeling world, so I didn’t think it was even an option. Now, I have the opportunity to not only be Miss United States for the year (which is a dream in itself) but represent my country on the international stage at Miss World. I truly feel like the luckiest person, it’s a humbling experience. If you could speak out about pageant stereotyping what would you say? There are stereotypes for everything, pageants are no exception. People’s misconceptions of pageantry make me even more determined to prove the stereotype wrong. The women I’ve encountered while competing have been some of the smartest, kindest, most talented, and most generous people I’ve ever met. In my experience, competing has made me into the best version of myself. Instead of going to parties in college, I was engaging in community service or focusing on physical fitness. Pageants like the Miss United States Organization, and others like it that stress the importance of inner beauty, make good girls into great women. What do you think the woman’s social rights and responsibilities are? American women have the same rights and responsibilities as men. We have the right to life, liberty, and the pursuit of happiness (among many other things) and we have the responsibility to make sure that we, and those around us, have the ability to exercise those rights. What pushes your hot button? Apathy! Nothing frustrates me more than someone simply not caring. My generation is soon to be the largest voting population and yet we struggle to get people to register to vote, not to mention take part in the election. This is why I’ve partnered with Rock the Vote as my national platform. Alongside this nonprofit, nonpartisan organization, I encourage people to register to vote and voice their opinion by exercising their right to vote. What do you consider a "luxury"? Nothing is more luxurious than the ability to spend all day on the beach with a good book! I used to have a list of things I wished I could change about myself. Competing in pageants taught me to see the beauty in everyone, including myself. Everyone is uniquely beautiful in so many ways. I’m a million times more happy now that I’ve accepted myself for who I am and stopped comparing myself to anyone else. I am eager and determined to make a difference in the world. To me, that quality, and not outer beauty, is my best quality. That determination is what I choose to see when I look at myself in the mirror. When I was crowned Miss United States, the best words of congratulation came from the people who told me that I was beautiful inside and out. In my eyes, there is no compliment better than to be told that you are beautiful on the inside. I don’t compete to win a “beauty pageant”, I compete to have the opportunity to serve. We still have a gender gap. Until that no longer exists, I cannot say that women have it just as easy as men do. However, we are a country of progression and we will continue to see improvements in gender equality. I am proud to be a woman and know that I can reach any goal with enough hard work. 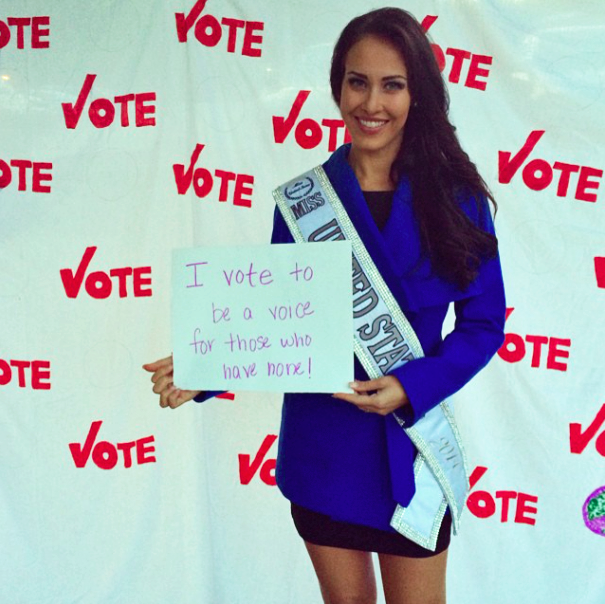 The Miss United States Organization empowers women. I am honored to represent an organization that celebrates female achievements and encourages them to aim even higher. If you had a daughter, would you recommend that she enter a pageant? Why? I would certainly share with her my beneficial experience with pageantry. It would be her decision as to whether or not she decided to compete. I didn’t compete until I was a freshman in college and I’m so thankful that my mom let me make this decision on my own. I would allow the same decision for my daughter but I certainly would share with her all of the wonderful experiences that I gained from pageantry and how it shaped me into a better woman. Should women be allowed to serve in equal combat roles in the armed forces? Why or why not? Anyone who is willing to serve and meets the mental and physical requirements of the military should be allowed to serve in combat roles. Illegal immigration is one of the biggest crises facing the United States right now. How do you resolve the problem of illegal alien children that crossed the border from Central America? Should they be deported or should they stay? America is the greatest country on Earth. People come here for the chance of a better life. I believe that all children deserve an opportunity to have a successful future in the United States, but it should be done legally. The Statue of Liberty boasts a sign which says, “Give me your tired, your poor, your huddled masses yearning to be free.” We must not turn away those who believe our country will give them the freedom they need to have a better life. There are many things I wish could be changed in the world, but the thing that saddens me the most is starving children with little hope for a better life. This is why I’ve partnered with Save the Children as my international platform and Beauty with a Purpose project. Today’s children are the future leaders of the world; we must save them now to create hope for the future. Save the Children promotes children’s rights and provides relief for children all over the world. If I could change one thing in the world, it would be that no child ever has to suffer. If you could pass any law, what would it be? I hope that one day there can be a law that would assure all children can grow up in a safe environment, free from hunger and abuse. What would be the hardest thing to give up on? It would be very difficult for me to give up on the causes which I’ve adopted as my national and international platforms. Even after my time as Miss United States ends, it will be impossible for me to give up on raising awareness of these issues. I will continue to devote time and energy to these causes as long as I am able. How do you handle people not liking you? If you could invite three people to dinner, who would it be and why? Audrey Hepburn, Ronald Reagan, Lynda Carter. Every girl, no matter what generation, can find something relatable and admirable in Audrey Hepburn. Her zest for life is still contagious. The political science nerd in me would opt for Ronald Reagan at the dinner party. I admire what he stood for politically and would love to hear how he was able to build bridges between political parties. Finally, I would invite Lynda Carter. She competed in the 1972 Miss World pageant. This invitation is for obvious reasons! There is much to be learned from the original Wonder Woman! Any beauty secrets that you'd like to share? I wear sunblock every day. Tanning might seem like a harmless idea now, but it will only lead to premature aging or even skin cancer. Always be forward thinking and don’t compromise the future health of your skin for a tan! A healthy alternative is a spray tan. My favorite is Glow & Go Organic Sunless Spray Tan! Why do you want to be Miss World? It would be an honor and a privilege to be Miss World. I want to be a source of happiness and a source of hope to people struggling around the world. I want to make a difference in someone’s life every single day. I hope to have this title so that I may have a better chance of leaving the world a better place, no matter how small. This would be an amazing opportunity to serve those in the world around me, to serve my platform on an international scale, and to be a beacon of hope. Music: I have a diverse taste in music, but growing up in the Carolinas I have a special appreciation for Carolina Beach Music! Author: Nicholas Sparks- I love that his books are set in the Carolinas!